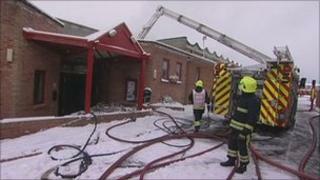 A leisure centre in Wiltshire which was badly damaged by fire is unlikely to re-open in the near future. Fire crews were called out on Saturday to the Lime Kiln Centre in Wootton Bassett - which was open at the time. Eleven fire appliances dealt with the fire in the roof space, described by Wiltshire Fire and Rescue Service as "severe". Members have been told they can use other centres run by DC Leisure - the nearest one is at Malmesbury.